Watching Rio from above: Cristo Redentor (Christ the Redeemer) and Pão de Açúcar (The Sugar Loaf). I get it, I get, the magnificent 38m statue of Christ is really, really impressive. (Especially after the road to get there. Especially if you choose the crazy mini bus option. How on Earth could anyone possibly bring the building materials by that road?!) Plus, it’s symbol of Rio. However, the Sugar Loaf offers a waaaay better view from several different levels – and the Christ is a part of this view, too! So if you have to only go with one, – and you might, because the weather in Rio is as temperamental as the national character, and it might happen so that you spend a week there under the rain (just saying),- go with the Sugar Loaf for the view. If you get a chance to visit both, get to Corcovado (where the Christ statue is) by train, it is a much more picturesque and, how to put it, sane option than a mini bus. The beaches. Leblon, Ipanema, Copacabana, Leme, – the entire beach cost of Rio is a world in itself, with street food, ad hoc bars, beach vendors and street musicians, setting the tone for a long evening slash night in Rio. Life in Rio happens on the beach: people flock here with the first rays on sun and stay throughout the day. It’s not all about gorgeous bodies though. Beach food is pretty much deep fried, and it is deeply felt: with a few athletic, mostly middle-aged exceptions, Rio beach bodies are full-blooded, curved, real and gym-agnostic. Theoretically, there are differences among these beaches, with Leblon being the most posh, Leme the most bohemian and the other two the most well-known and, therefore, touristic, but I did not feel them that much. Lapa Steps (Selaron’s) Staircase, the famous flight of stairs, with tiles from all over the world, is a must, as guidebooks have it. Right they are. It also is a great reason to visit Lapa, a neighbourhood of Rio, which is very different from the beaches and feels more like a city than like Disneyland. On the way to the Staircase, you see all kind of stuff, from hipster bars to trans-gender prostitutes, lurking in the narrow streets. The Steps are gorgeous, of course, but try to come photo catch them at a less conventional time to avoid the crowd, if the previous sentence is not a barrier for you. Many guides list Confeitaria Colombo, a gorgeous hall full of picturesque sweets, as the best brasserie in town. Well, it is not. There are two lunch offers, a downstairs one for a more budget-friendly version and an upstairs one to scale things up, and the food is just not that great. The place itself is beautiful though (and oozes history), so you should come for a dessert and some good Brazilian coffee. Botanical Garden is a must see, and it is worth it. Something in-between a planned English garden and a rainforest, it is a great area to walk for hours and to hide from the sun. Make sure to check the orchids, they are many and spectacular. Terra Brasilis Hostel in Santa Teresa, Monmartre of Rio. Ask the guys working at the hostel to check out their terrace and soak in one of the best views of Rio. Santa Teresa is a great area in itself, with lots of colonial houses and steep hills with a view. European tourists flock in while most of the Americans are too cautious to wander here. Taking a ferry to Niteroi, which is, theoretically, a different city and, in practice, is a neighbourhood across from the central Rio. It is a great way to get fantastic shots of Rio coastline and that of Ilha Fiscal, a small island with a mid 19th century Neo-Gothic castle and some greater military purpose. With the ferry ticket at around 1 USD, it does not really get better. Parque Lage is a fairytale place, which I have spotted in The New York Times article. To my surprise, it is not really trending across the Internet, but the open architectural ensemble with the stunnng views on Christ the Redeemer is really magical. Botanical Garden of Rio: colibri!! Aprazivel is a restaurant in Santa Teresa with a great city view and authentic Brazilian food. Think palm hearts (Aprazivel’s trademark) and fish in coconut. Get there during the day time to truly enjoy the view and make sure to go back (well, and to get there) by cab. We did not and soon slipped into a neighbouring favela: a set of multi-colored (and multi-layered) houses, built without any permit in an ad hoc, I-bring-my-family-from-other-lands kind of fashion. As much as Christ the Redeemer, favelas are symbolic to Rio. Even though there are favela tours, which are presumably safe, favelas are synonymous to all sort of street crime. And you really feel it there. The thing is that in Rio favelas are often located next door to the most expensive city’s property (one, Vidigal, was just at the back of our hotel), so slipping into one of them is really easy. Well, don’t. A more bourgeois-friendly Brigite’s across from Sushi Leblon. For daily mortals’ choices, resort to the Leblon area for dozens of inspiring sandwich/ salad/ burger places. All are fantastic. Make sure to try açai, a starter/main/dessert made of a local berry. For me (I don’t eat meat and potatoes and don’t like bread), açai was a life-saver and the best Brazilian food. I could eat it for every meal. For the hotel choices, I wold recommend any of the famous beaches. We loved being close to Leblon with all the hipster food places. We stayed at SPG’ Sheraton and it was really, really good: way better that Sheraton brand in Europe and worlds apart from the Sheraton in the U.S. (on the trajectory towards Mount Olympus). The Executive Lounge on the 27th floor has the best city view you can ask for – and the best breakfast. 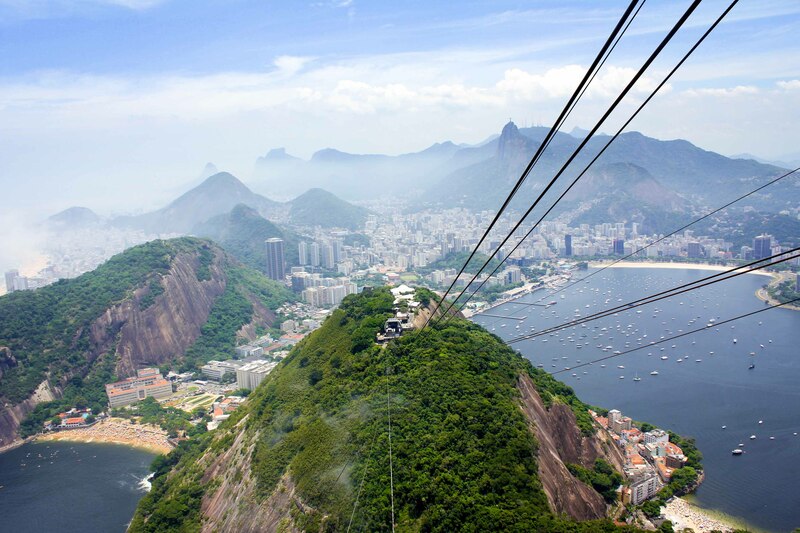 Rio was a land of discovery for me: different from everything I knew, magical, fascinating. It was there that I learnt that some of life’s best things happen at 6 a.m. Like this sunset, which we tried to capture multiple times during our stay, only to wake up to the clouds (or thunderstorm). Finally, on our last morning in Latin America, the Sun emerged to show us Rio at its best. That’s how I remember it: pure, magnificent, gorgeous, sun-kissed. Now it would be nice to spend a little time there too for us. Probably not a few years but a few weeks! Make it a few weeks then! The weather is absolutely unreliable all the year round and once you go there, you need some time to make sure you will have time to see more than just tropical rain. 🙂 7 days of good weather is enough to see the city. So jealous of you to go there. My God!!!! I can’t say anything… the photoes…. they are really really impressive! And the best beggining of the working week is to read your travel experience! I ve took a comfortable chair+big cup of good coffee+earphone. My music choise was especially for Brazil travel: “Samba de Verao” by Bossarenova Trio:Paula Morelenbaum, Joo Kraus & Ralf Schmid. This song is my personal soundtrack to brazilia, I was found it in one brazilian sitcom. Mm.. I somehow doubt the angel part 😀 especially for the entire year! Rio is dangerous: nothing happened to me, but then I was in flip flops and shorts, with next to zero jewellery but yet with a pretty good camera. If you don’t wander in favelas and bling bling, I believe it is ok in most of the places, and “most of the places” is really sufficient to experience the great part of Rio. There are even tours to favelas which are (supposéd to be) safe with a guide.